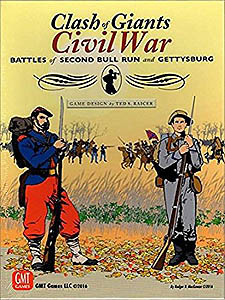 Clash of Giants: Civil War, takes the game system from Ted Raicer's popular and critically acclaimed Clash of Giants WWI series to two of the storied battles of the American Civil War: Second Bull Run and Gettysburg. CoG: Civil War uses a modified version of the chit-pull Activation system of Clash of Giants II: Campaigns of Galicia and First Ypres, 1914, while retaining the CoG combat system. Every (mostly brigade-level) unit has a Tactical Efficiency Rating based on its morale, training, leadership, and experience, but even a poor unit can have a heroic moment, while the Iron Brigade might not always be made of iron. It is a true player's system. The Activation rules, which combines random formation activation (mostly corps for the Union and divisions for the confederates) with variable movement allowances, creates the fog of war and friction so important to civil War battles. Ordering your corps commander to take a hill is one thing - getting him to act as you wish is another. And because these effects are achieved without hidden counter/dummy unit mechanics, CoG: Civil War is not only a fast-paced two-player game, but excellent as well for solo play. The two battles, Second Bull Run and Gettysburg, depict one of Lee's greatest victories, prior to his first invasion of the north, and his greatest defeat during his second invasion. Both are meeting engagements, with limited forces deployed at the start, gradually building to mighty clashes. The arrival of fresh forces is another area where the game system allows variability: units may be delayed or arrive at the wrong road. You can even attempt to speed the arrival of your off-board forces, but at increased risk of their arriving later instead.